Here's a pic of one of the coolest gifts that I've received in a long time. Well it's not actually my gift, it's a gift for my baby girl. A good friend of mine and fellow adoptive mommy sent these books on behalf of her 1 year old daughter (these happen to be her favorite); "Please baby please" and "whose toes are those". I love them and I know my daughter will too! Reading these beautiful books to her will just give the two of us valuable time to bond. 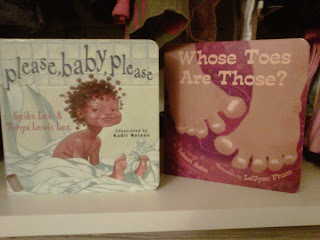 I actually think the little girl in "please baby please" resembles my daughter, minus the hair...my girl only has a few downy feathers for hair, for now:-) We're still awaiting word of a court date keep us in your prayer please, thank you. I can't wait to see her!! I am definitely praying for the entire process to go smoothly! ReneeB. I'm believing that it will go smoothly too. Congrats again! Thank you for standing in agreement with us. Congratulations on becoming a grandmother...what a blessing!